The orange team lost three shoes, but all eight team members were accounted for at the end. That’s a 13-shoe survival rate. 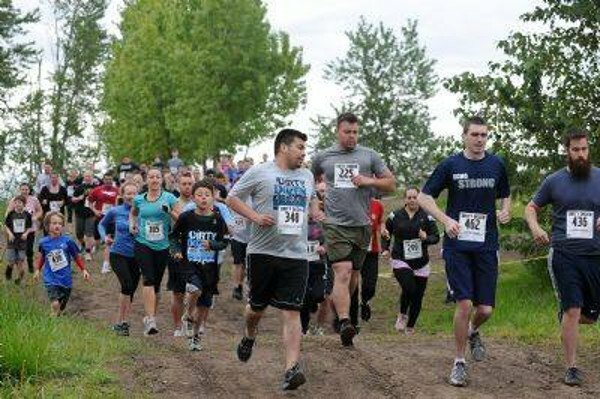 The eight runners were competing in the fourth annual Dirty Dozen 5K Adventure Challenge at the Albany Motorsports Park in Oregon. 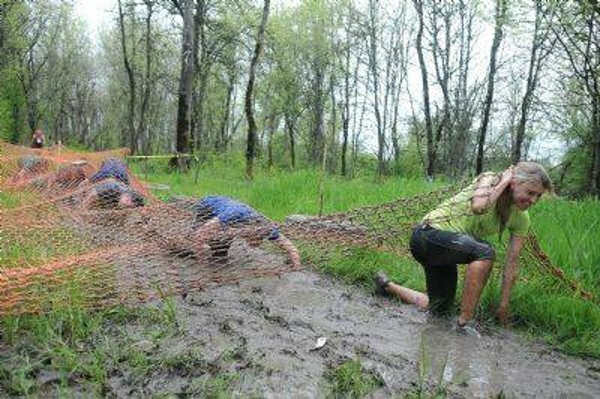 They’d joined almost 400 runners, all signed up to run the three-mile course through sludge, mud holes, slippery hills and 12 obstacles. Such events have been gaining in popularity. Races like the Tough Mudder, Warrior Dash and Rugged Maniac draw thousands each year with competitors vying for the gravitas only afforded through volume of participation. Yes. Mud runs have become a “thing,” as the saying goes. Other teams wore tutus or had crazy dyed hair. Others wore pearls, blending the elegant and filthy. All of them paid $35 for the chance to run three miles, plunge into the mire and court the possibility of contracting amoebic dysentery. Of course in the end, there are trophies, chili, beer and a proliferation of photos sent out to the social-media universe to preserve a record of accomplishments. The kids went first. About 100 ran a one-mile course, dashing though with a pass to get as muddy as they pleased. Next up, the grown-ups ran, spread out across the course. The horizontal cargo net was pure quality. Runners there had to crawl, combat-style, through a thick soup of Oregon sludge, with no clearance between their backs and the net. Many became caked from head to toe. One Mudley Crew member, who had stopped mid crawl to pose for a photo, drew the ire of his teammates, all backed up behind him, forced to lay still in the filth while he had his close up. But the agitation was all in good sport, and the team moved downrange, closer to the end, and their stated goal of enjoying a cold beer. Still others, wading nearly spent through-ash gray water, rolled underwater to clear a traffic barrier set up as an obstacle across the pond. Some elected to go around, which, of course, would disqualify any officer candidate in the Marine Corps. But this is not the Marines, this is Oregon. Back at the finish line, as music filled the air, Mudley Crew regrouped, enjoyed their beers and laughed at the fun they had, all of them filthy, with smiles all around. That they were missing three shoes only added to their bragging rights. Nearby, post-race mud crazies enjoyed cups of chili while others ascended a climbing wall or ran a hay bale course where they hauled sandbags up and down the stacks. More than likely, the National Guard soldiers running a recruiting booth at the event were happy to not be doing either. Their ACUs were crisp and mud-free, and one of them sported the hefty resume point known as the Combat Infantry Badge. The mud, for those soldiers, can wait.